It goes without saying that every bride deserves a wedding day which is beautiful, stylish and stress-free. But it seems to me that somewhere along the way we’ve all got a bit lost in the idea of everything being flawlessly perfect and we’ve forgotten to do the most important thing of all: enjoy ourselves! I have a natural inclination to want to organise everything to within an inch of its life; but my driving force is not the desire to make everyone’s wedding look like a spread from a magazine but the hope that everyone will just be happy on the day. ‘Just’ indeed! I wonder how many couples have the same optimism but get slowly and surely dragged down by ‘shoulds’, tensions and too much sweating of the small stuff. Has this happened to you? Don’t get me wrong – there’s nothing wrong with wanting picture-perfect, in fact it’s highly desirable! But if you ask me, you’ll get a much more natural result if you don’t try too hard. Do what you want and not what you ought to and you will be more contented for it. For me, a room full of smiling faces, the sounds of laughter and the knowledge that nobody noticed that the wedding breakfast started 7 minutes behind schedule are signs of a job well done. If you’ve been to as many weddings as I have you will know that the very best ones are those which are full of personality and where the day whips by because you’re having too much fun to notice. Sometimes things do go ever so slightly awry, but that’s the beauty and unpredictability of human nature and British weather for you! And you can either let it take you down or you can revel in the knowledge that these things happen and that you are having way too good a time to care (note my own ridiculous, grinning face below)! 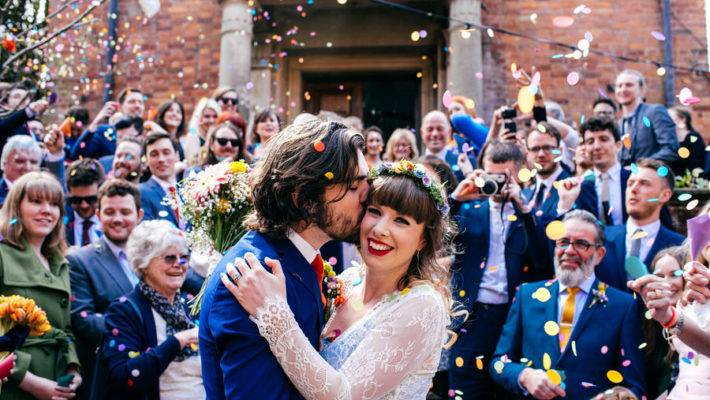 You can plan a distinctive and vibrant wedding! Any wedding planner worth their salt should be able to take the stress out of planning your wedding. But planner or no planner, your wedding can be individual and distinctive, vibrant and full of character, and most importantly exciting and enjoyable from start to finish. This is your day to do exactly what you want with, and it will (hopefully!) be the only time you do it, so throw all those fixed notions and textbook clichés out of the window, let someone else do the worrying, and just focus on relishing every moment of it. If what you really want is to be relaxed, happy and surrounded by smiling faces, then don’t let anything stop you. Everything is possible with a little help, some imagination and a healthy dose of positive thinking! It doesn’t need to be perfect; it just needs to feel good to you. If you agree with me (or even if you don’t!) and you’re looking for a bit of support or inspiration, then I am here and happy to help. Have a look at my website www.threegracesweddings.co.uk or email me at cassie@threegracesweddings.co.uk if you think I can assist you in any way.